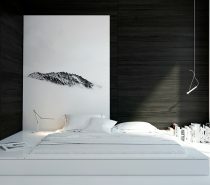 Often used in bedroom design, the soft appeal of grey can cool many interiors. 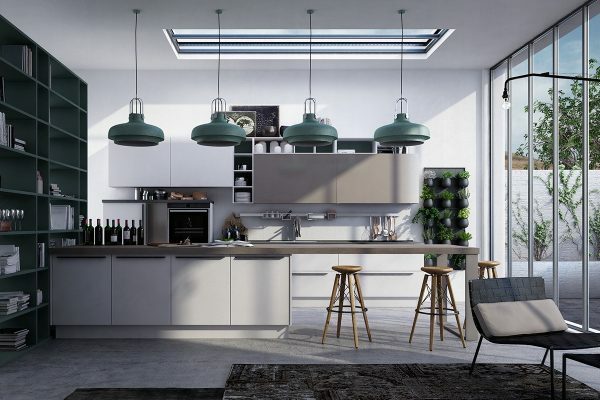 Yet one secret power remains – its subtle transformation of kitchens. 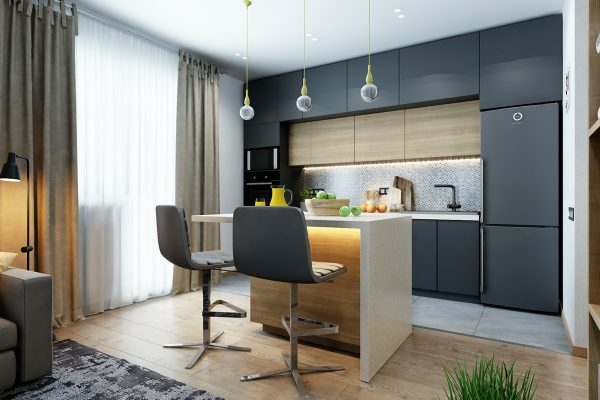 Often left in the cold for warmer wooden tones, its ability to make a kitchen look fresh and contemporary works wonders for a range of home styles. 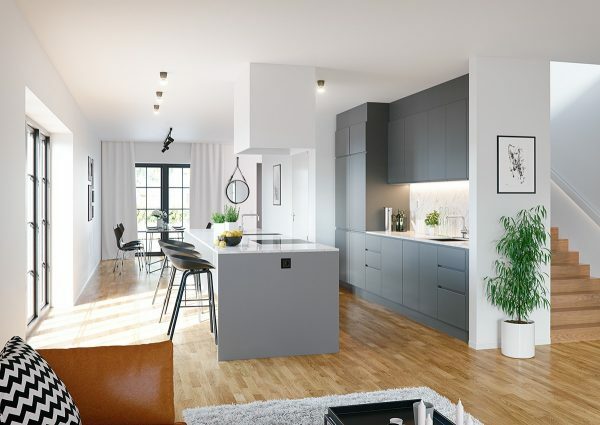 Whether blending into white, creating the industrial or making smooth moves in charcoal, its range and depth of hue rival many traditional kitchen colours. Paired with brighter yellows and tonal blue gradients, it offers a clean palette without the drama of white or black. Look at our top forty picks for yourself. 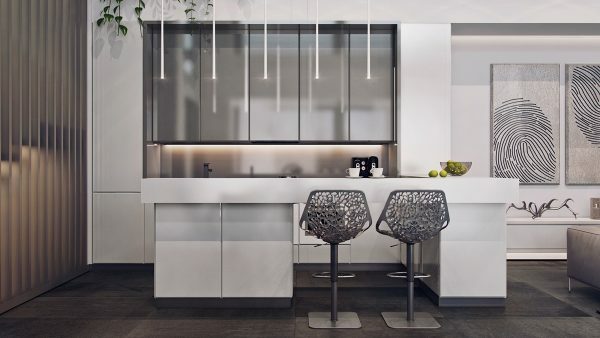 Striking yet muted in mid-grey-panelling, a strip of LED-lighting sits pretty above contrasting white peonies. A touch of difference to a white wall and light flooring, this grey hue keeps it fresh while storing books. Wall-to-floor tiling embraces grey and white, as bauble lights join the party. 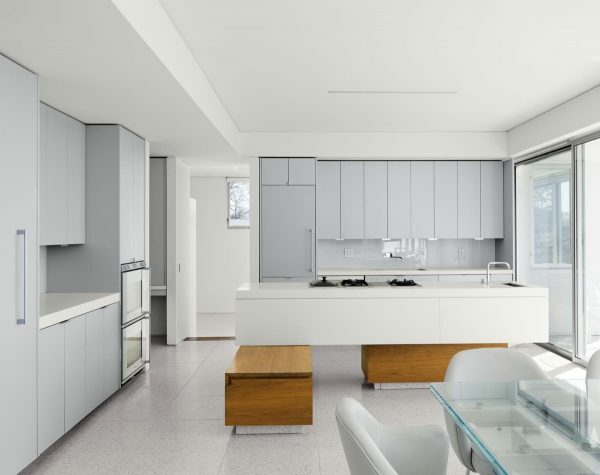 Under-cabinet lighting draws the eye from the dining area. Mimicking a game of tetris, this multi-shaped wonder with a large, slanted window keeps everyone guessing. 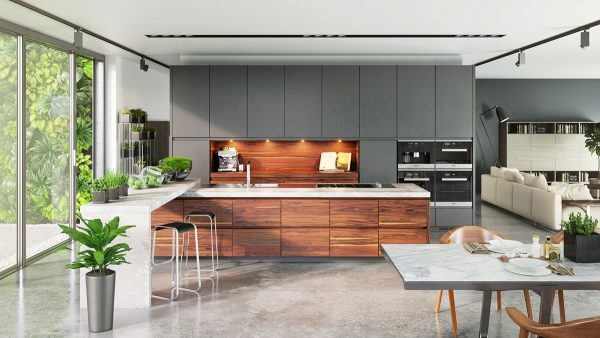 Concrete and wood battle it out in this industrial design. Spot and multi-level hanging lights frame one side, a cupboard-panel-as-art-piece the other. 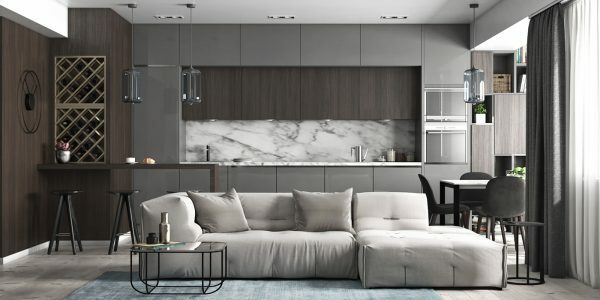 Small spaces can benefit from grey the most. This light-grey design only slightly contrasts with wooden panelling, while a minimal bench offers class in slate. 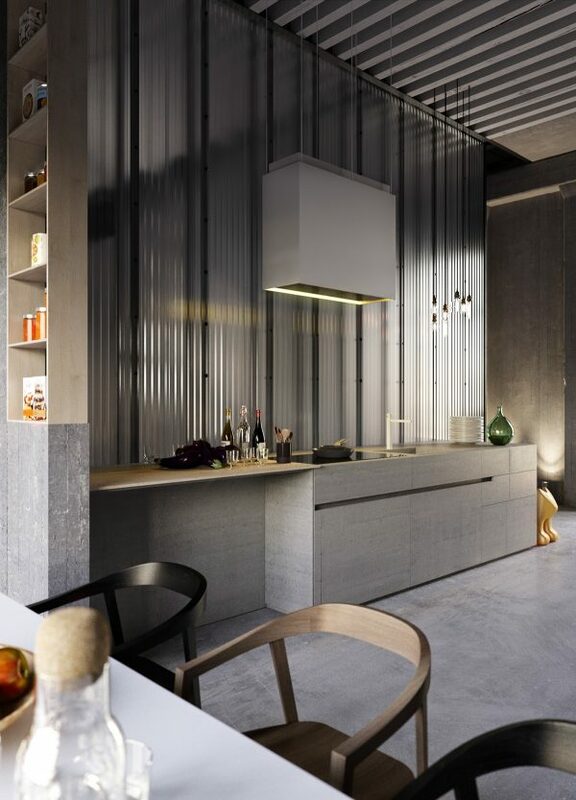 Corrugated plastic adds modernity to this kitchen, an unusual find with concrete benching. 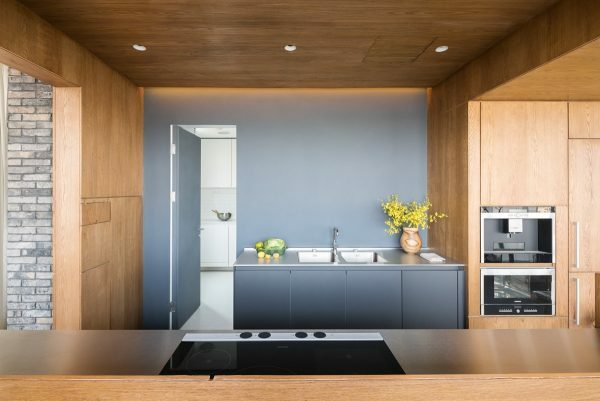 A slither of wood acts as a focal benchtop. A workshop is evoked with this stencilled interior, complete with ladder. 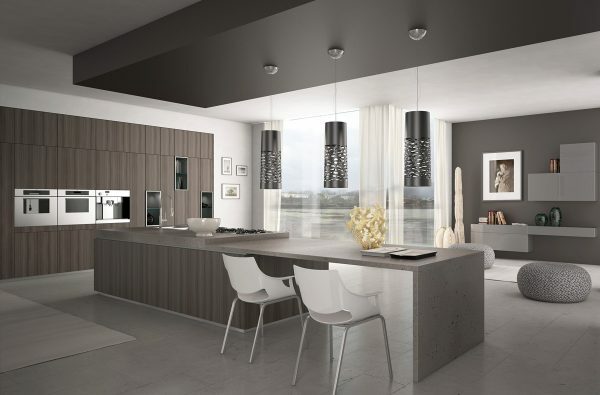 Shades of grey provide the eclectic while keeping the colour palette clean. 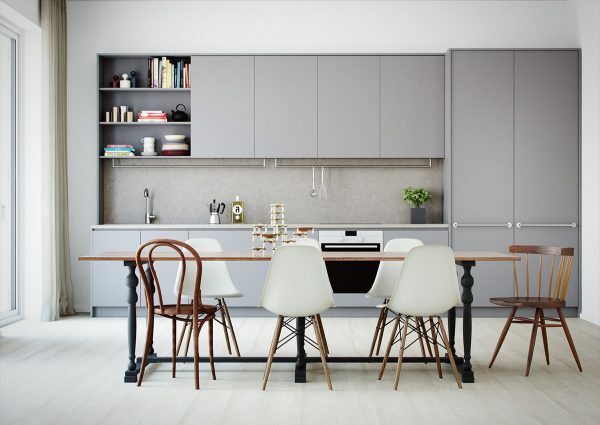 A marble splashback and bench win favour in this grey-framed kitchen. A simple wooden table keeps the space open. 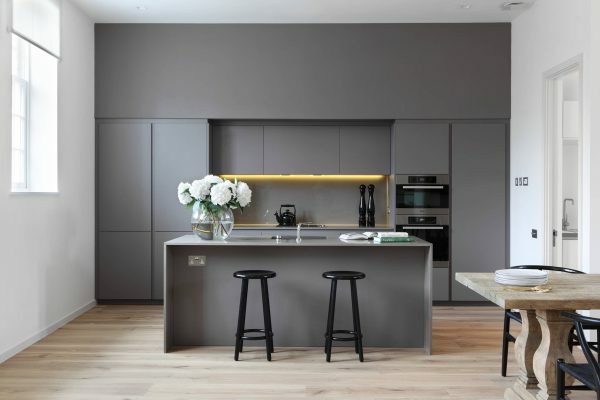 Minus table, this charcoal-panelled kitchen holds no clutter. 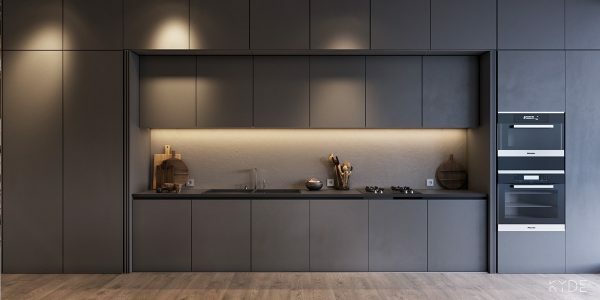 Ambient lighting under cabinetry keeps focus on the inlet. 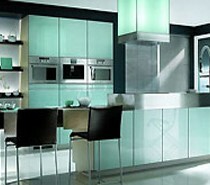 A set of three LEDs foreground another sleek kitchen frame, in mid-grey. A dark-grey wooden panel draws the eye, while mottled tiles retain interest. 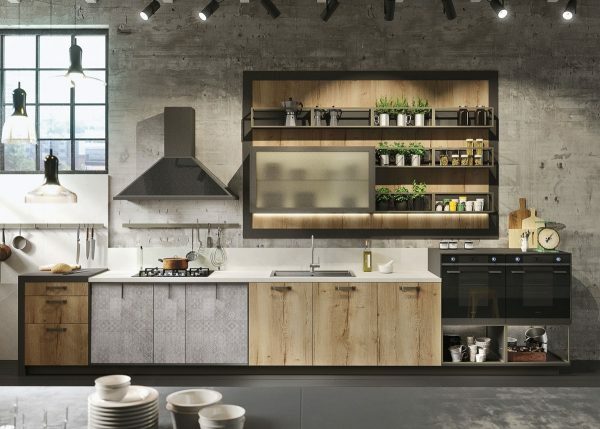 Want a kitchen with a café vibe? 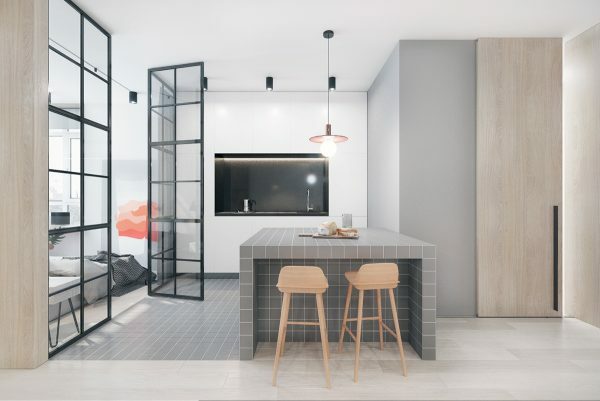 This steel-and-wood creation holds simple wooden shelving on matte walls and grey wooden floors. Almost out of a picture book, this kitchen’s spiderweb chandelier, rounded ceiling, snaking extractor fan and windy bonzai add something of the spooky to mealtimes. 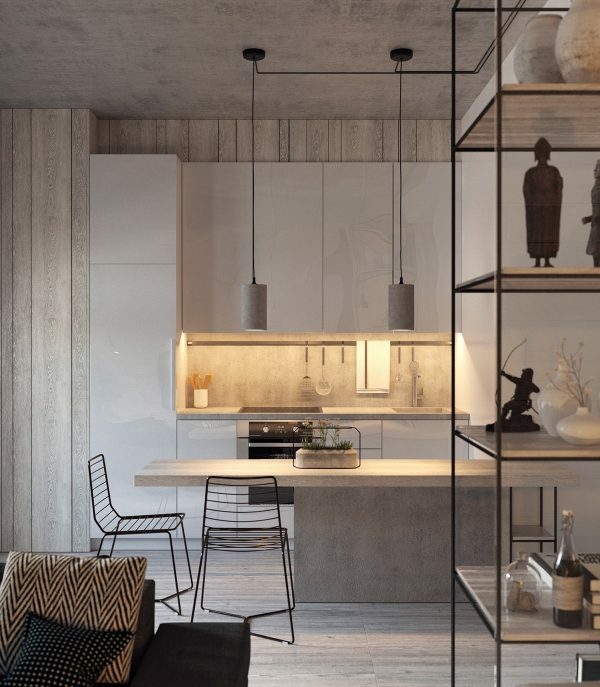 A grey concrete floor and darker wood features keep the look far from kitsch. Grey need not be boring. This wood-encased design injects blue into the mix, with same-colour walling extending the space. 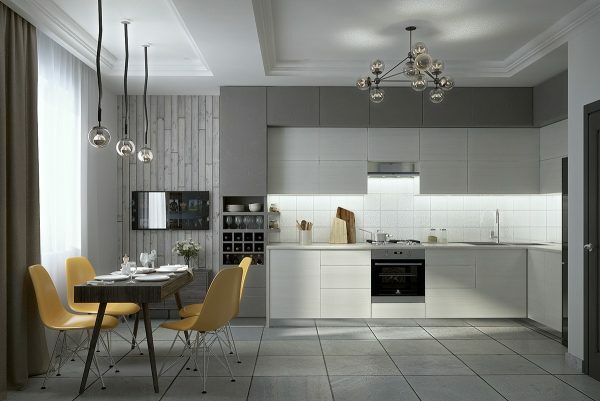 Give the Italian kitchen a revamp with exposed brick walls, wood and cabinetry in grey. A set of five steel drop lights separate the dining area. Prefer to be unique? 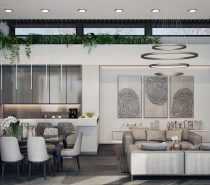 Why not hang an art piece on grey matte walls amidst hanging potted plants, an L-shaped bench and cobweb chandelier? 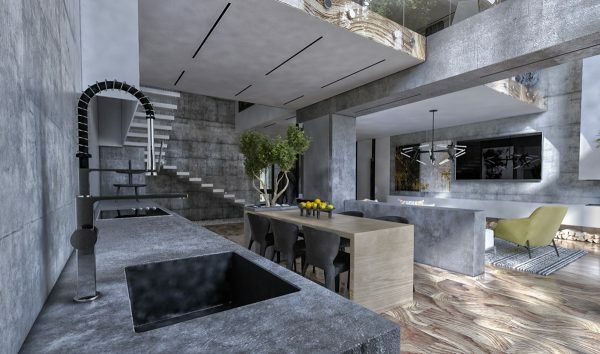 Textures reign king in this design marked by brushed concrete and wavering wood. An industrial tap hovers amidst a series of block grey and wood shapes. 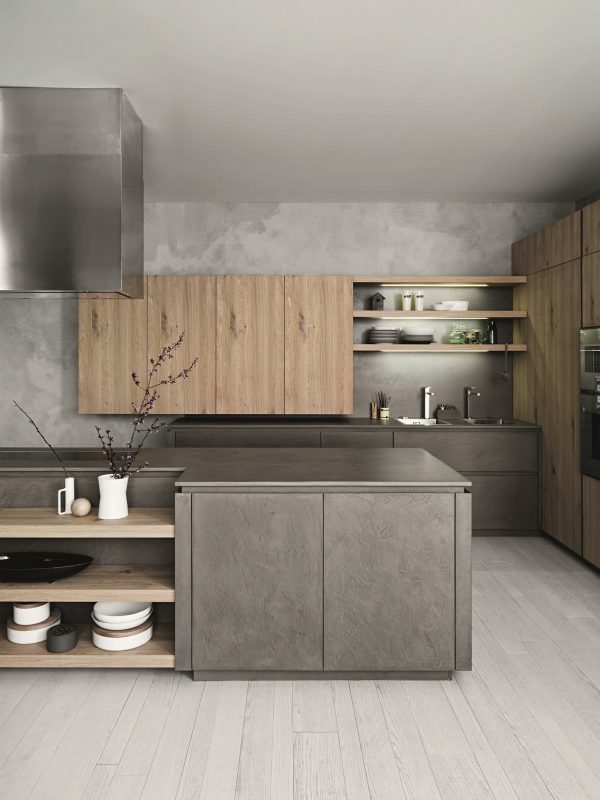 Separate the traditional elements and re-house them in wood and grey. 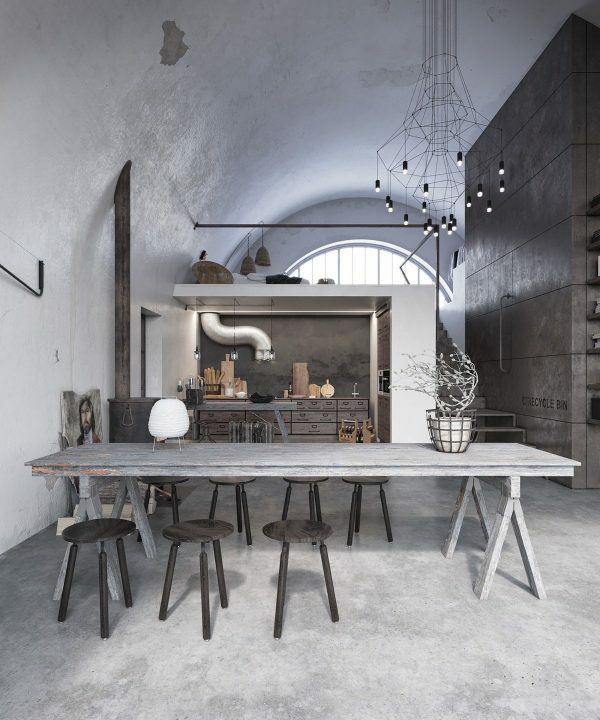 This concrete-floored design features an oven in a wood block and a bench as a central table. Grey can be a supporting act. 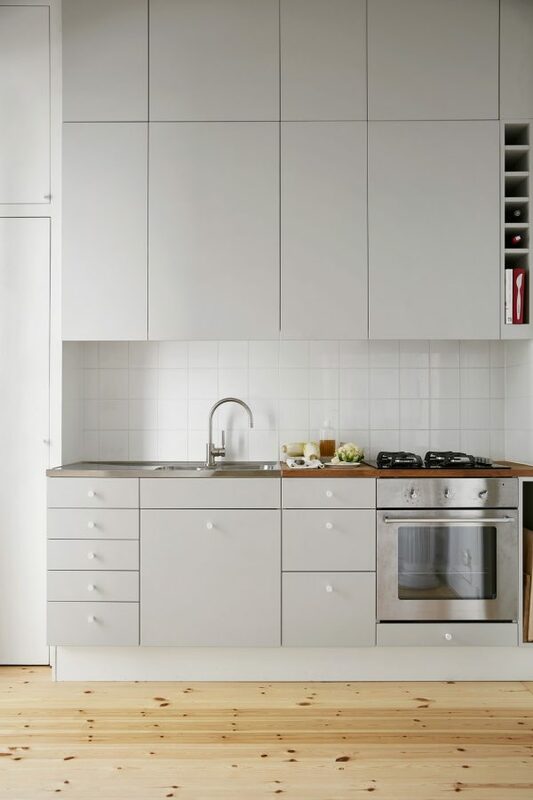 This mostly-white design sits pretty against a dark charcoal wall with chrome cabinetry bottoms. Only have a corner space? 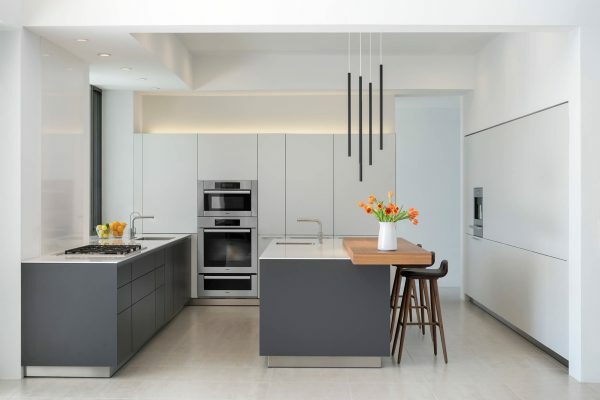 Make the most of it with sleek grey cabinetry and a copper inlet. 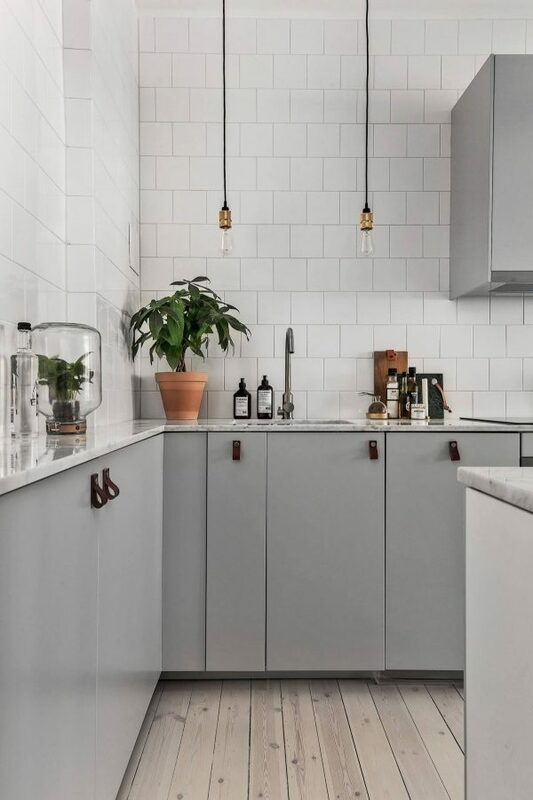 Go almost-white in this kitchen twisting the Scandinavian. 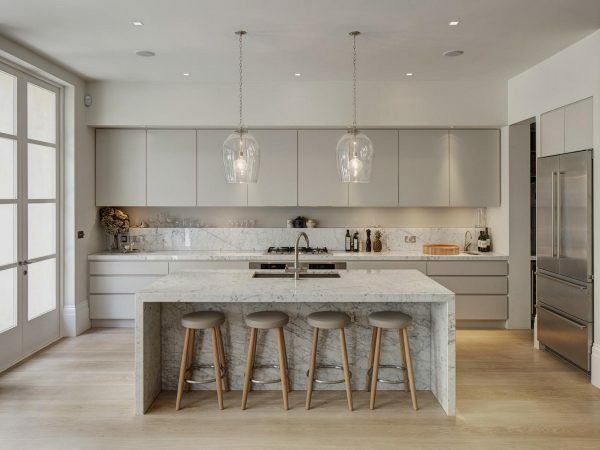 A rough-shod wooden floor and white tiling do the talking. 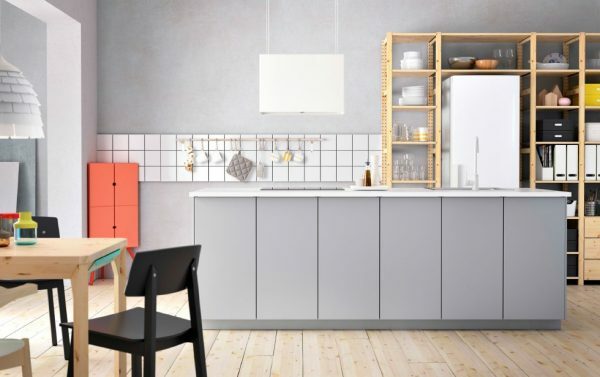 IKEA can do all the classics, and grey is no exception. This simple six-doored design sits against the same hue, as a row of white tiles hang the necessities. The little fixtures can be the heroes. Grey backgrounds a marble-grey benchtop, a series of plants and two idea lights. 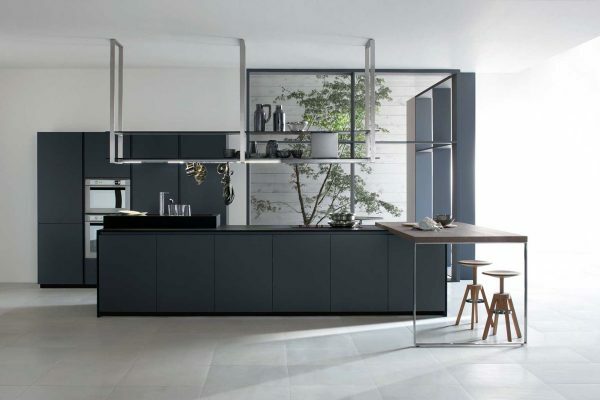 A Japanese theme revels in this kitchen’s grey tiles and feature wall. 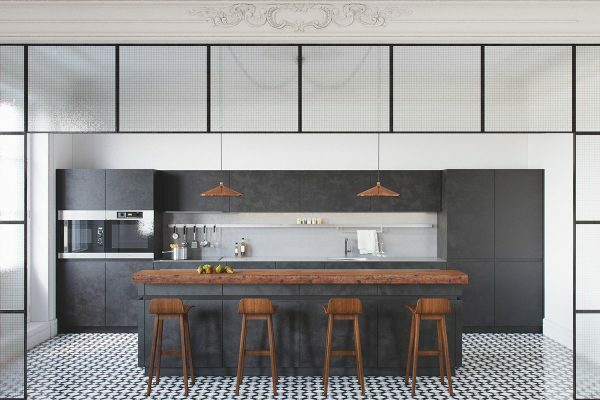 Pops of wood and beige tiling keep warmth, while a darker inlet serves food. 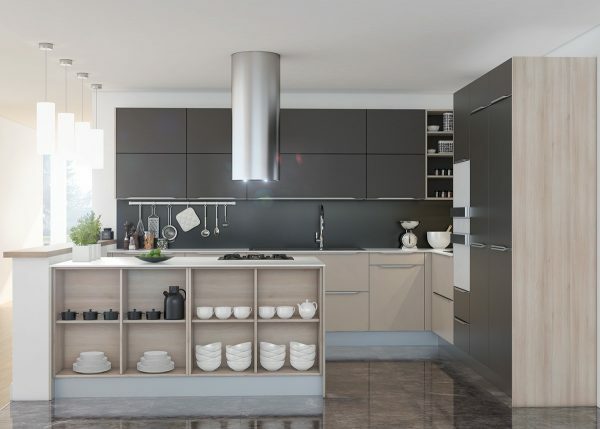 Heighten a low space with shortened grey cabinetry. 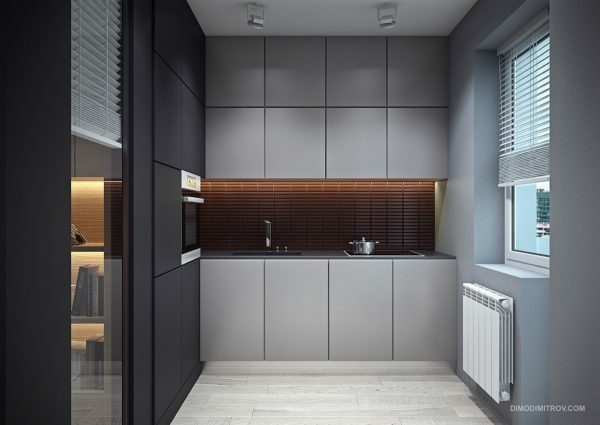 Placed on a grey strip of tiling, lining cabinet tops in black gives the illusion of height. 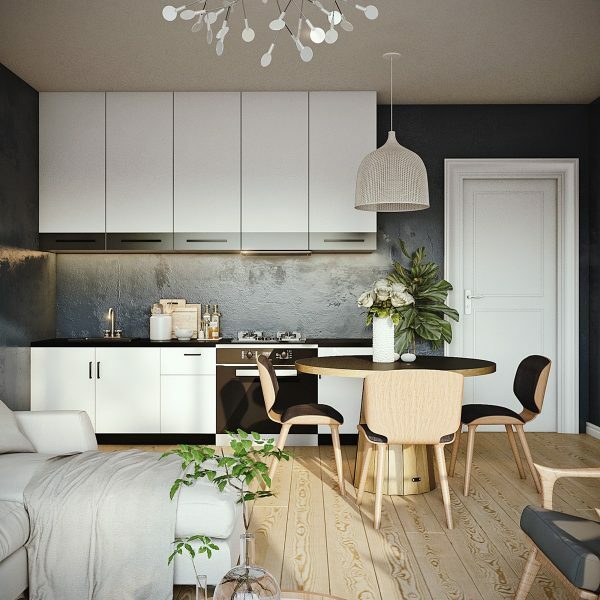 Studio apartments are made for this charcoal-and-wood creation. A patterned grey-tiled inlet adds distraction without clutter. 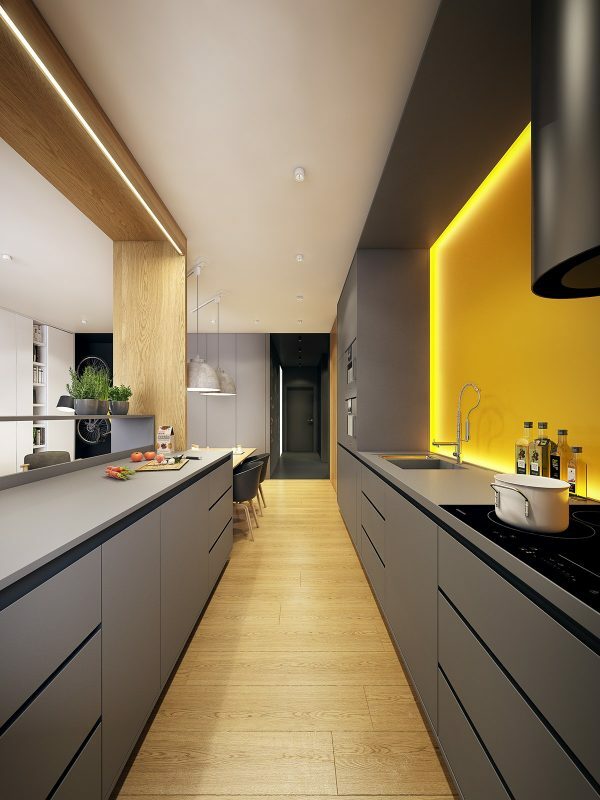 Grey and yellow kitchens are not for the faint-hearted. 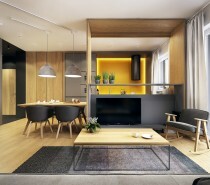 Muted charcoal and wood panels allow bright yellow to shine. 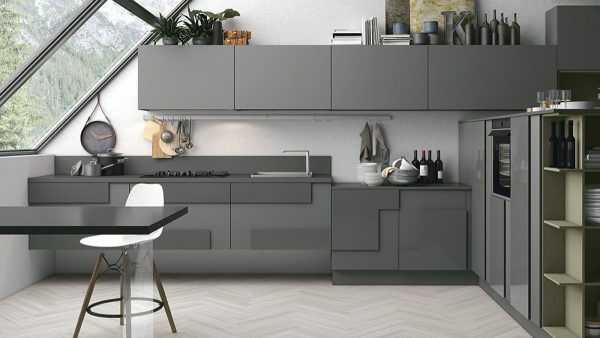 Hide grey’s influence with this kitchen with darker-shade borders. 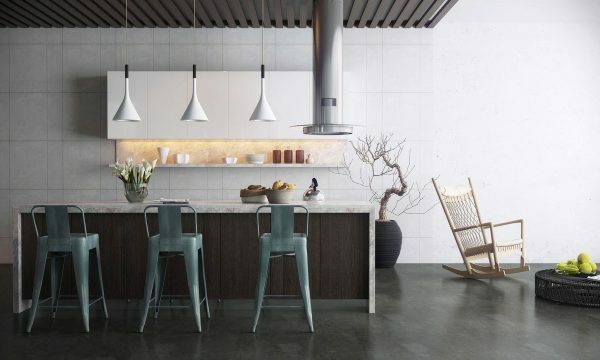 Teal stool chairs and white features are greeted by a steel extractor fan. Dark, mid- and light-grey oscillate in a range of shapes and sizes. 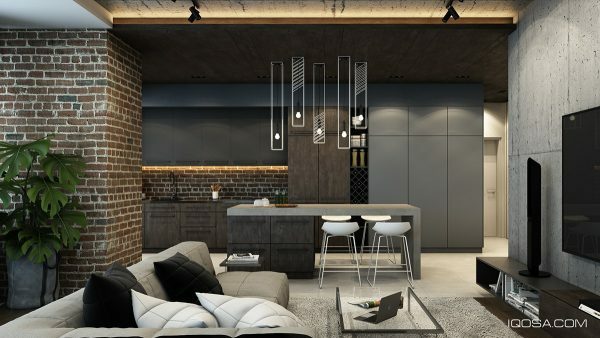 Striped-wood cabinets and three filigree feature lights add artistic balance. 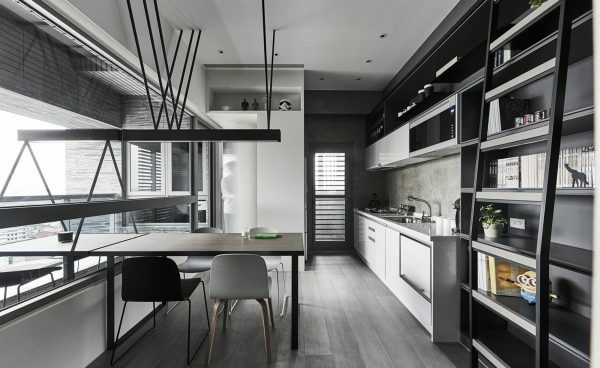 Grey and wood juxtapose nicely in this light, bright, and breezy interior. 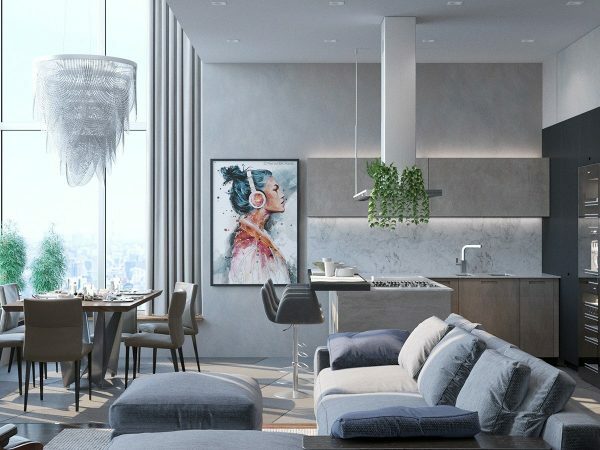 Grey adds enough difference to create a dreamy, not sleepy, design. 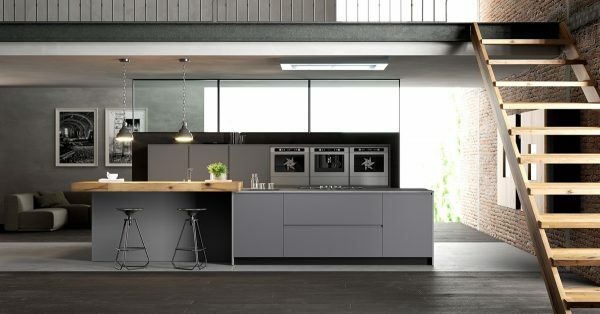 Charcoal and wood mix up cool and warm hues in this kitchen. 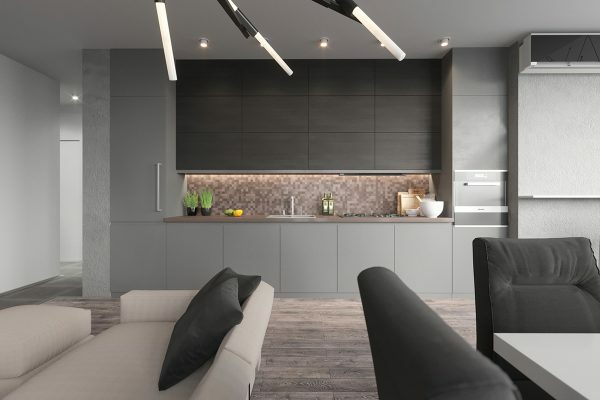 Grey cabinetry extends the living room wall, allowing LED-lit wood to shine. After just a little less black? 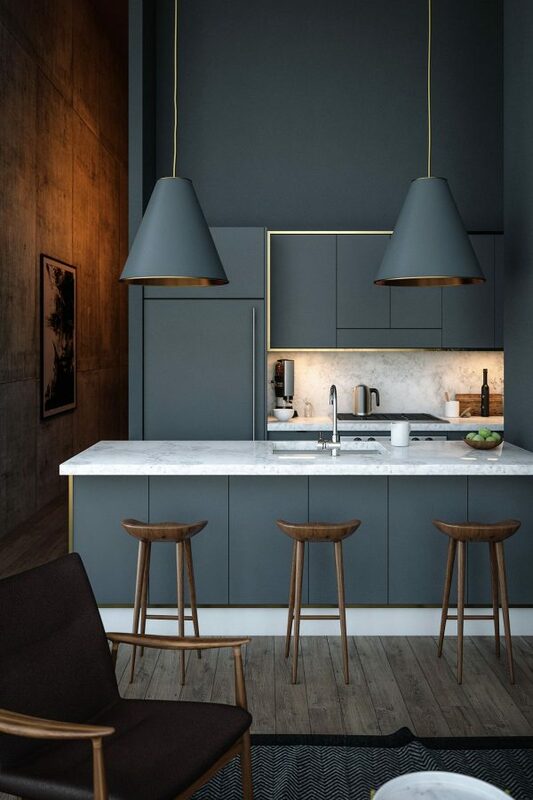 Go for grey’s darker shades in a matching bench and cabinetry, overhung by a fascinating steel stencil feature.